• Authors: Raffaella Schneider et al. My very first astrobites post was titled “A Star that Should Not Exist” which you can find here. It discussed the discovery of an extremely metal-poor halo star, which rattled our current understanding of star formation. The nice thing about discoveries like this is that it tests our understanding of physical phenomena and drives us to investigate these unsolved problems – which is what this article aims to do. 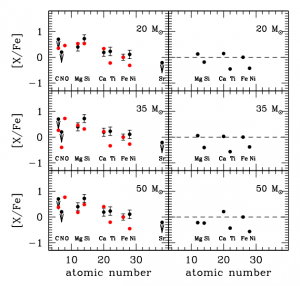 Comparison between the observed element abundance ratios for J102915+172927 (left) and the chemical yields of Pop III supernovae with progenitor masses of 20, 35, and 50 solar masses. This elusive halo star, which has a mass less than 0.8 solar masses and is located in the constellation Leo, has the memorable name SDSS J102915+172927. It has an extremely low metallicity – about 4.5×10-5 times that of the Sun. 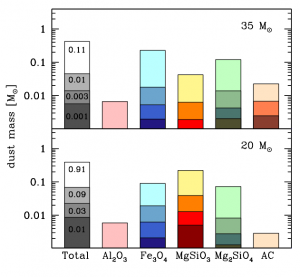 Low-mass stars with such low metallicities may only form in environments where a fraction of the metals are in dust grains. This is because dust, just like metals, act as efficient coolants, keeping molecular gas at a low enough temperature such that gas clumps can fragment and form low-mass stars. My previous article describing SDSS J102915+172927 (link above) discusses why you need such efficient cooling to form low mass stars. In this paper, the authors reconstruct the initial star forming conditions for the birth environment of SDSS J102915+172927 by using detailed pre-supernova and supernova explosion models of Population III stars (i.e., the first stars which are metal-free) to fit the observed elemental abundances of this star. By computing these supernovae models for stars over a stellar mass range of 13-80 solar masses, the authors find that the chemical yields from supernovae progenitors with initial masses of 20 and 35 solar masses are in good agreement with the observed chemical abundances of J102915+172927, excluding Ti and Ni, as shown on the right. The deviations between the chemical yields of Ti and Ni and observed abundances of these elements may be a consequence of an unconventional behavior of the deep interior of the star such as mixing which the stellar evolutionary models do not consider. As the supernova expands and cools, the metal-rich ejecta can reach a low enough temperature for dust grains to form (i.e., dust condensation can occur). Since the supernova ejecta are traveling supersonically, the supernova shock wave will start to slow down once it has swept up enough material from the surrounding medium. This deceleration launches a shock in the the ejecta which moves towards the source star. This shock is called the reverse shock and it can also destroy the dust via a process known as sputtering. That is, the energetic particles in the reverse shock of the supernova explosion can knock atoms off the dust by colliding with dust particles. If the dust-to-gas ratio passes a certain threshold then sub-solar mass stars can form. This is because the dust acts as an efficient coolant and can cool the surrounding gas to a low-enough temperature for sub-solar mass fragmentation to occur. 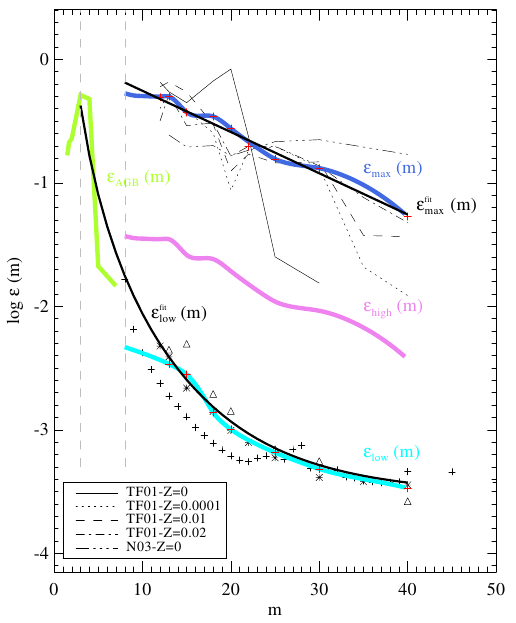 Dust mass and composition for the two supernovae progenitors. Each histogram represents the dust mass in units of solar masses formed at the end of the dust condensation phase (top light color) and after the passage of the supernova reverse shock assuming three different densities of the circumstellar medium: ρ= 10-25 g cm-3, 10-24 g cm-3, and 10-23 g cm-3 from top to bottom. The figure to the left shows the dust yields from the 20 and 35 solar mass supernovae progenitors. The authors find that the supernovae yield a greater total dust mass as the parent cloud density decreases. The authors attain a large enough gas-to-dust ratio required for a star like J102915+172927 to form from the explosion of a metal free 20 solar mass supernova if the supernova explodes in a medium with a density less then approximately 10-24 g cm-3 . For the case of the 35 solar mass supernovae progenitor, the authors find that fragmentation for sub-solar mass stars can only occur if the dust grains which form are small and also if enough dust survives the reverse shock of the supernova explosion. Thus, in order to create a star like J102915+172927, the star-forming environment requires enrichment by a supernova. The progenitor star for the supernova must be metal-free so that its chemical yields will be in agreement with the metal content of J102915+172927 and the birth environment also requires a low enough density such that enough dust, which results from the supernova explosion, can survive the reverse shock of the supernova shock wave. I am a graduate student at the University of California, Santa Cruz in astronomy and astrophysics. I obtained my Bachelor’s degree in physics and astrophysics at the University of California, Berkeley. My research interests are in theoretical stellar astrophysics with an emphasis on the formation of massive star clusters and massive stars.